Patrick McDonald (left) is president of the Athens chapter of the American Wine Society. 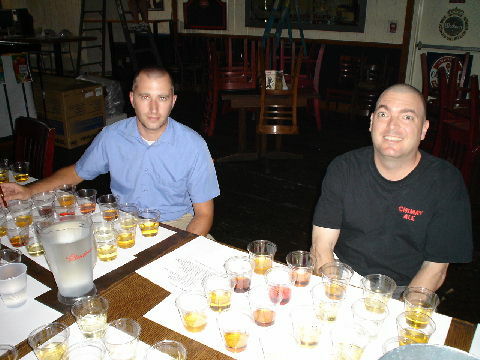 John Gayer (right) is a beer manager at Wild Wing Cafe in Athens. L-R: Thel Melton, Mark Pfeiffer and Jeff Rapp. Owen Ogletree (director of Brewtopia Events LLC) gathered together a 12 person tasting panel made up of beer judges, a wine writer, bar owners, wine enthusiasts, and wine merchants. The tasting was held upstairs at Wild Wing Cafe in downtown Athens, Georgia where we sampled and commented on 20 different meads from around the world. This sampling was done as a "best of show" blind tasting where no one was aware of the brands that were being served. 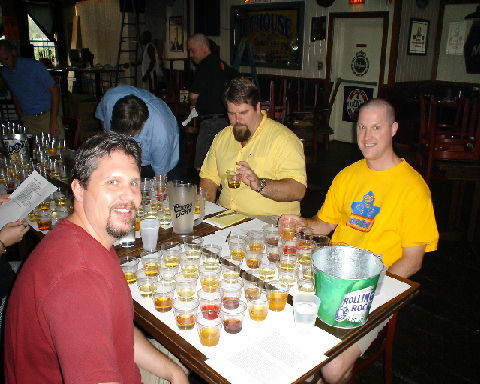 Products were informally commented upon and ranked according to Beer Judge Certification Program (BJCP) mead guidelines. First, second, third places, and honorable mention were awarded to the products we felt represented their individual styles in extraordinary fashion. Owen filled out one BJCP mead score sheet for each mead based on everyone's combined comments (these comments are summarized below). Drop Owen an email to share your comments and opinions. Traditional Mead: A wine made from honey, water and yeast. A blend of different honeys is often used. Varietal Honey Mead: A mead produced from honey from a particular flower source. Fruit Melomel: A mead made with the addition of fruit or fruit juices. Metheglin: A mead made with spices or herbs. Aroma: Interesting, vanilla, brown sugar, molasses, licorice, cinnamon. Very complex. Appearance: Dark amber, clear, gorgeous rich color. Flavor: Lots of honey with hints of bay leaf, all-spice, clove, caramel, and maple syrup. Very sweet and dessert-like with a big mouthfeel. Viscous and cordial-like. Impressive mead. Aroma: Spices, clove, phenolics, sea-like hint. Flavor: Cinnamon, cooked apples, nutmeg, allspice. Nice sweet mouthfeel with a citrus finish. This is a great winter mead that is like a fine dessert wine. Aroma: Honey and alcohol with notes of flowers, heather, lavender, leather and talc. Appearance: Medium gold - clear - attractive. Flavor: Prunes, dark candied fruit, alcohol, pine resin, fruity esters. There is a nice honey balance here. Like a rich fruit cake. The scotch notes are pleasant, but in the background. This mead has layers of complex flavors, and the scotch comes through at the end. Aroma: Apple pie, cinnamon, tobacco, brown pie crust. Honey notes are subdued. Appearance: Gold color with a slight haze. Flavor: Honey, cinnamon, yeast, allspice. Cinnamon almost covers the vanilla notes completely. There is a somewhat bitter finish with baked apple and honey notes. This is a complex, spicy mead with perhaps too much cinnamon. Very pleasant overall. Aroma: Tobacco-like with notes of cedar. Honey is very subdued. Vanilla, spiced baked pears, leather, brandy and coconut aromas are powerful. Appearance: Light amber and clear with heavy "legs" of glycerin. Flavor: Coconut, nuts, almonds and caramel. This has a huge mouthfeel and is very cordial-like. Sweet and viscous with beautiful woody, cedar notes. A powerful sipping mead for winter. Dessert-like - would be nice with a fine cigar. Aroma: Solvent-like, banana, lemon-rind, musty. Aromas are all very mild. Appearance: Clear with an attractive golden color. Flavor: Sweet, dessert-like, honey flavors all around. There is a big sweetness and not much complexity. A big mouthfeel and lots of honey flavor. Aroma: Apple, pear, butter, alcohol and honey. Flavor: Bitter finish with some oaky, tannin flavors. There are also cider and alcohol notes. This has a bit of a dry finish with semi-sweet qualities up front. Aroma: Toasted nuts, burnt electric wire hints, pepper and phenols. Appearance: Gold, clear - glows when held to the light. Flavor: Smoky, butterscotch, fruity, oaky notes. This has a very complex flavor with notes of pepper, phenols and tannin. Finishes a bit sour. A fruity, pleasant mead with a better flavor than aroma. Aroma: Mild citrus with hints of smoke. Very light aromas. Appearance: Pale yellow with some very tiny bubbles. Flavor: Light honey, dry, acidic and sage-like. Herbal with a mineraly, phenolic, acidic quality. Some notes of butter are present. This is a refreshing and drinkable mead. Aroma: Foxy - muscat, labrusca grape-like. Very floral. Flavor: A bit thin with hints of acid, herbs and medicine. Too low in residual sugars. Medicinal flavor in the finish. A complex mead with nice floral, herbal notes; slightly astringent, acid undertones detract. Aroma: Citrus, phenolic, lavender, candy-like notes. Also smells a bit oxidized (papery). Appearance: Light yellow and very clear and brilliant. Flavor: Orange soda hints. Very mild flavors - thin mouthfeel. Tastes somewhat like an artificial, processed orange flavor has been added. Slight oxidation is possible. This is a very quaffable, light mead. Aroma: Citrusy, musty, ammonia-like. Very mild aromas of mold and cheese. Mild honey is in the background. Appearance: Clear with a small hint of carbonation. Flavor: Citrus, honey, cane sugar with some thin vanilla/oak notes in the finish. Also a bit earthy, tart, cellar-like. Could have some wild yeast that contributed these flavors to the fermentation process. A very drinkable mead that is reminiscent of rock candy flavors with a touch of tartness. Aroma: Prunes, paint, solvent, raisins, run, plastic, sherry. Appearance: Dark gold, clear - very pleasing to the eye. Flavor: Alcohol notes with a hint of phenolic, oxidized flavors. Tastes a bit like dark, aged fruit. Not very drinkable - heavy in plastic, spicy, phenolic flavors and a bit medicinal. Aroma: Honey-like with some notes of corn and lactic acid. A bit cereal-like in aroma with earthy, sweaty, yeasty hints. Appearance: Medium gold - clear - pleasing. Flavor: Corn and green apples with notes of butter. A bit sweet with an abundance of fruity esters. Some yeast (autolysis) notes are possible. A very complex mead with many layers of flavors and sweet honey. Aroma: Cider, earthy, sweaty notes. Salty aromas with notes of musk and peach. Some phenolic (plastic, clove) hints. Appearance: Golden, clear and attractive. Flavor: Tart and a bit phenolic with acetic and lactic notes. Very subtle peach character. Dry and light - should be a bit more clean with more honey and peach flavors and aromas. Aroma: Fruity, mild peach and apricot. Hints of green apple with some musty, almondy aromas. Very mild aromas. Flavor: A bit bitter and astringent with very little honey character. Could be more balanced. Vegetal notes. This is an interesting mead with some Chablis-like wine notes. Aroma: Bready and yeasty with some raspberry notes. Appearance: Light pink in color. Clarity is good. Flavor: Flowers, fruit, honey, herbs, raspberry seeds. Flavors are subtle, but the fruit does come through. This mead has a good balance. Clean, dry and quaffable. Acid level is good. Finish is dry. Aroma: Raspberry extract, candy, light honey. Appearance: Deep rich red and clear. Ruby-like color is very eye-catching. Flavor: A bit vegetal with candy-like fruit notes. Nice honey character is too far in the background. Sweet, corn syrup notes are present. Needs more honey and natural fruit flavors and aromas. Aroma: Pinesol, cola, caramel, citrus. Appearance: Dark amber with ruby highlights. Some sediment is present. Flavor: Tannic, floor cleaner astringency. Very perfumy, piney and resiny with lots of medicinal, chemical notes. Not a pleasant mead - too harsh and astringent. Aroma: Mint, vanilla, raw oak, tannins and phenols. No honey in aroma. Appearance: Light gold and clear. Flavor: Honey with minty, green wood, turpentine hints. Mild complexity - sweet with much warmth from alcohol. A drinkable mead, but could use less hot alcohol and more honey and mild oak character and balance. A bit harsh.